After the defeat of Germany and the Ottoman Empire in World War One, the area that had belonged to the Turks was broken up into mandates. The area that is now Iraq and Kuwait (as well as what is now Jordan and Israel, and parts of Saudi Arabia) was placed under British authority. The British created two kingdoms to reward Arab allies that had fought the Turks with them during the war. These were Transjordan, now called the Hashemite Kingdom of Jordan, and Iraq. The Kingdom of Iraq was composed of the Ottoman provinces of Al-Mawsil (Mosul), Baghdad, and Al-Basrah-with the exception of the area known as Kuwait. That area was retained as British territory. Why? World War One was a very expensive undertaking for the British Empire, in terms of manpower and treasure. The empire's saving grace was its colony in India, the so-called "jewel in the crown." The British, always a maritime power, needed to protect the sea lanes between the British Isles and the Indian subcontinent. 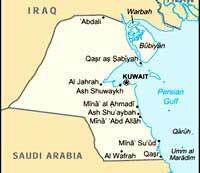 Kuwait's excellent natural harbor was to serve as a base for the Royal Navy. Kuwait-British relations dated back to a treaty signed in 1899, giving Britain responsibility for defense and foreign affairs. That was reaffirmed in a 1913 British-Ottoman agreement, however, this agreement was never ratified. The Iraqi people saw the creation of Kuwait as a British protectorate as an affront to their newfound sovereignty. They claimed the British told them that Iraq was to include the entire former Ottoman province of Al-Basrah, which included Kuwait. However, following World War One and well into the latter half of the twentieth century, Iraq was powerless to challenge British influence and authority in the region. In 1961, when Britain no longer needed Kuwait's harbor, it granted the sheikdom its independence, and the State of Kuwait (Dawlat Al-Kuwayt) was born. As soon as the British announced Kuwait's independence, Baghdad reiterated its claim on two Kuwaiti islands situated between Iraq and mainland Kuwait, Warbah and Bubiyan. The two islands are important to Baghdad because they control access to the Persian Gulf via the Khawr 'Abdallah. The Khawr 'Abdallah is the only alternative to the Shatt Al-'Arab-the waterway that forms Iraq's border with Iran-which had been closed by sunken ships and unexploded ordnance since the beginning of the Iran-Iraq War in 1980. Iraq also reiterated its claim on all of Kuwait, again based on the argument that th entire Ottoman province of Al-Basrah was part of Iraq. As British forces withdrew from Kuwait, Iraqi military units moved to the new state's northern border. It appeared that Iraq might try to take by force what the British had been unwilling to give. However, in 1961, Iraqi forces were no match for the well-trained, well-equipped professional British armed forces. The British re-deployed forces to Kuwait and took up positions on the Al-Mutla' ridge north of Kuwait City. Kuwait also called on the Arab League to send forces to defend it from the Iraqis. In response, military units from Egypt, Saudi Arabia, Jordan, and Sudan deployed to Kuwait. The moral presence of Arab League forces and the military power of the British forced the Iraqis to back down. Although Iraq did recognize Kuwait's existence in 1963 (coincidentally at the same time an $84 million grant was made to Baghdad), none ever recognized the border as drawn by the British until 1994. On March 20, 1973, Iraqi troops seized the Kuwait border post at Al-Samitah. Baghdad announced that it was annexing a part of "occupied Iraq" near the Iraqi port city of Umm Qasr. Once again, Kuwait appealed to the Arab League; Saudi Arabia mediated the withdrawal of Iraqi forces. In 1983, there was another incident in this same area, but Iraq decided not to pursue the matter, since it needed access to Kuwait's ports and Kuwaiti money (in the form of loans). In 1990, Iraq claimed that Kuwait was illegally extracting oil (valued at $2.5 billion) from the Iraqi side of the de facto line of demarcation between the two countries. This claim, believed by many to be true, may have grown from Iraqi frustration over Kuwaiti Emir Sheikh Jabir Al-Ahmad Al-Jabir Al Sabah's refusal to forgive Iraq's $10 billion debt from the Iran-Iraq War. Once again, Iraq voiced its claim to the islands of Bubiyan and Warbah, as well as Kuwait itself. The Gulf War The story of the Iraq-Kuwait confrontation that led to the Gulf War is well known. Following months of Iraqi demands for debt relief and Kuwaiti refusals to forgive the debt, Iraqi forces moved again to the northern border of the tiny sheikdom. This time there was no mediation; Iraq seized Kuwait and a few weeks later declared it annexed as the nineteenth province of Iraq. Foreign diplomats were ordered to close their embassies and move all representation to Baghdad. In November 1994, Iraq was pressured by the United Nations to recognize the sovereignty, integrity and borders of Kuwait.